Gelsemium Sempervirens is native to warm temperate and tropical America from Guatemala north to the southeastern United States. 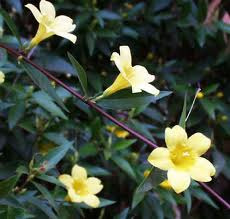 It has a number of common names including yellow jessamine or jasmine, evening trumpetflower, and woodbine. Yellow jessamine came into regular use from the middle of the 19th century chiefly as a treatment for nervous disorders such as sciatica and neuralgia. In its homeopathic form, gelsemium is prepared from the fresh root, which is chopped, soaked in alcohol, strained, and diluted to the desired, highly dilute potencies. Homeopathic physicians prescribe dilute solutions of gelsemium for many type of ailments. Homeopathic uses for gelsemium mainly affects the brain and spinal cord, the motor nerves, muscles, eyelids, and mucous membranes. Gelsemium alleviates headaches that intensify with movement or bright light and feel as if there is a tight band around the head; a sore scalp due to nerve inflammation; muscle pain associated with fever, nervous disorders, uterine pain and painful menstruation, achy right-eye pain, a sore throat with red tonsils, difficulty swallowing and earache and summer colds. It is given for feverish symptoms, such as a sweaty, flushed face, an unpleasant taste in the mouth, a furred, trembling tongue, twitching muscles that feel cold and tingly and chills with waves of heat along the spine. Gelsemium is also used for fears, such as surgery or going to the dentist, and fear after a shock. All are accompanied by trembling. Overexcitement that causes the heart to miss a beat, drowsiness, and insomnia are also helped by Gelsemium. At times the remedy has been given to strengthen courage on the battlefield, and it is often used for phobias, exam nerves, stage fright, and other anticipatory terrors, which cause trembling, weakness, diarrhea, and frequent urination. In addition, the remedy can be given for hay fever if accompanied by these symptoms. The Gelsemium plant is toxic. All parts of this plant contain the toxic strychnine-related alkaloids gelsemine and gelseminine and should not be consumed. Children, mistaking this flower for honeysuckle, have been poisoned by sucking the nectar from the flower. Homeopathic gelsemium is safe for consumption because it is highly diluted.